We've added a bunch of things to OwnerRez over the past couple of months to greatly increase the level of automation you have available to you when responding to inquiries, answering emails, setting up email templates for certain situation, and integrating with your own website. Each of these things builds on the other, so this will be a multi-part blog series -- starting with an overview and delving deeper into each item one by one. Rules define what is allowed at a given property, and can be found as a new section under each property. You can set up rules for anything from maximum number of guests to minimum number of nights per stay, to minimum number of days before arrival a booking may be accepted. These rules are applied through the system, particularly to automated systems like book now widgets and auto responders. If you manually create a quote or booking that violates the rules you have set up, you'll get a warning, but will be able to override that and manually continue with the booking. 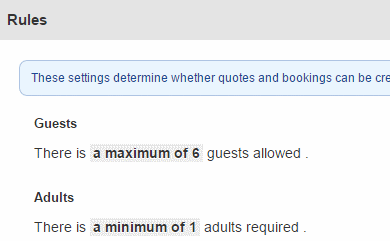 The automated systems won't violate the rules -- if a guest submits an inquiry for 10 guests and you've got a maximum of 8 allowed, for example, they'd either automatically get a rule violation email or that inquiry would be kicked into the manual queue for you to address. The ribbon calendar widget is a multi property calendar that looks similar to the one in the Bookings section in OwnerRez. 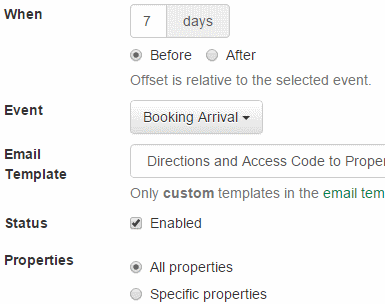 The Booking/Inquiry widget can accept bookings directly on your website. It collects contact information, dates, and guest counts, creates a quote for the guest, and lets them check out. All of the information is validated against the rules and rates you have set up for the property to ensure it matches your criteria. If the information violates the rules, only an inquiry will be allowed. You can also set the widget into inquiry only mode if you want to use it as a contact us form. Auto responders analyzes incoming inquiries and instantly responds to them via email. Auto responders builds on the rules you have configured for the property and allows responding with system default or auto responder specific email templates. There are three different categories of inquiries: Available, Unavailable, and rule violation. You can enable or disable each category separately, and set individual templates. For a fully automated system, enable all auto responders and every inquiry will recieve an immediate response. You can also enable one or more separate ones and deal with the rest of the inquiries manually. For example, maybe you want to manually handle unavailable time or rule violations so you can upsell guests to other dates or properties, and automatically respond only to Available and Quotable inquiries so guests can immediately check out. Just set the relevant settings and you're up and running. 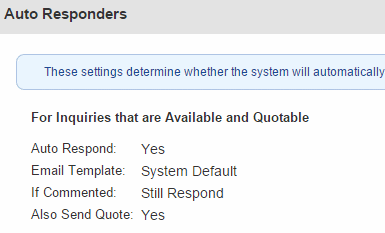 Auto responders are disabled by default so we don't send out any unintended inquiry responses or quotes. They can be enabled/disabled for each property separately. We have enhanced and renamed the "scheduled email templates" capability we had before and broken it up into "custom templates", "email triggers", and manual "scheduled emails". This is the first step toward making a much more powerful event trigger system. We don't have any dates to give out for the bigger system, but we've got ideas for other trigger events on the drawing board, like payment and security deposit charges, as well as plans for other contact types like SMS or automated phone call. For now, this trigger system allows you to be much more specific with email, add custom emails manually as well as having event triggered emails based on booking arrival and departure. Each trigger can be configured to be applicable to all properties or a specific set of properties. 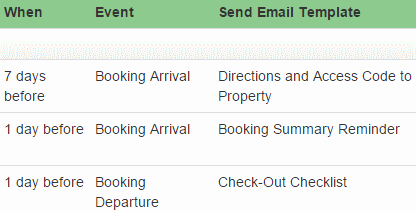 The email tab for each booking gives a clear view of exactly which emails will be triggered on what events and when for what bookings. You can also use the booking email tab to skip emails for a given booking, send them early or multiple times if the guest didn't receive, or add manually scheduled emails to the booking. You can find the new Triggers and Email Templates sections under the main settings section.